This guide is primarily concerned with outdoor ac substations, either conventional or gas-insulated. Distribution, transmission, and generating plant substations are included. With proper caution, the methods described herein are also applicable to indoor portions of such substations, or to substations that are wholly indoors. No attempt is made to cover the grounding problems peculiar to dc substations. A quantitative analysis of the effects of lightning surges is also beyond the scope of this guide. The intent of this guide is to provide guidance and information pertinent to safe grounding practices in ac substation design. The specific purposes of this guide are to: a) Establish, as a basis for design, safety limits of potential differences that can exist in a substation under fault conditions between points that can be contacted by the human body. b) Review substation grounding practices with special reference to safety, and develop safety criteria for design. c) Provide a procedure for the design of practical grounding systems, based on these criteria. d) Develop analytical methods as an aid in the understanding and solution of typical voltage gradient problems. e) Provide benchmarks cases to compare the results of IEEE Std 80(TM) equations to commercially available software programs. The concept and use of safety criteria are described in Clause 1 through Clause 8, practical aspects of designing a grounding system are covered in Clause 9 through Clause 13, and procedures and evaluation techniques for the grounding system assessment (in terms of safety criteria) are described in Clause 14 through Clause 20. 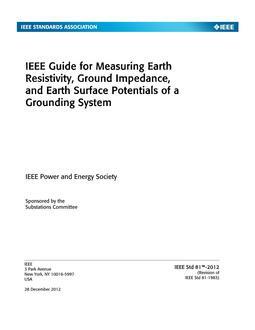 Supporting material is organized in Annex A through Annex H. This guide is primarily concerned with safe grounding practices for power frequencies in the range of 50 Hz to 60 Hz. The problems peculiar to dc substations and the effects of lightning surges are beyond the scope of this guide. A grounding system designed as described herein will, nonetheless, provide some degree of protection against steep wave front surges entering the substation and passing to earth through its ground.